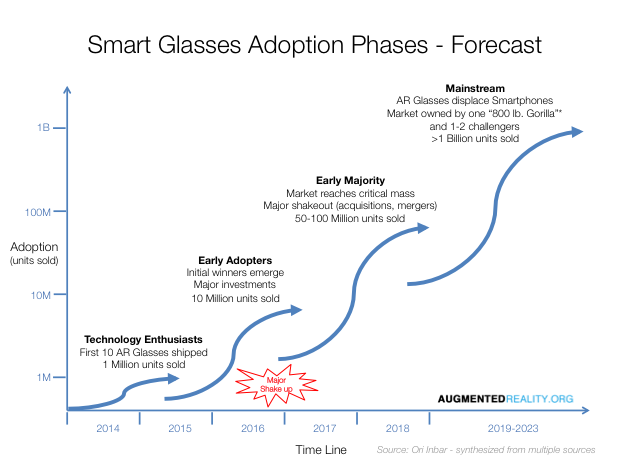 New York, NY – November 5, 2014: A new report by AugmentedReality.Org is predicting that the Smart Glasses market will soar towards 1 billion shipments near the end of the decade. 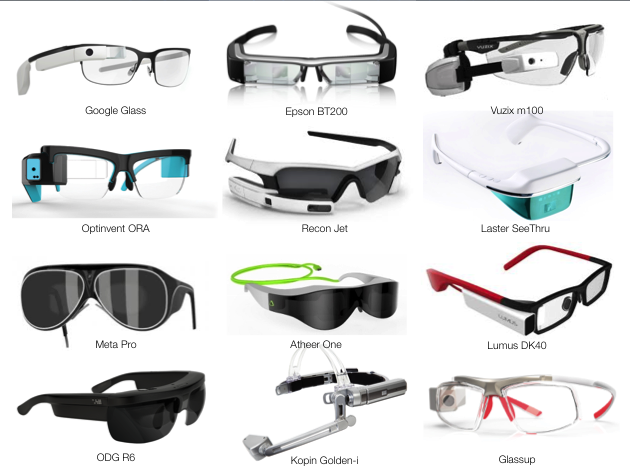 The report, “Smart Glasses Market 2014”, defines the scope of the Smart Glasses (or Augmented Reality Glasses) market, predicts how fast it will ramp up, and which companies are positioned to gain from it. It forecasts the adoption phases between 2014-2023, the drivers and challenges for adoption, and how hardware and software companies, as well as investors should plan ahead to take part in the next big computing cycle. 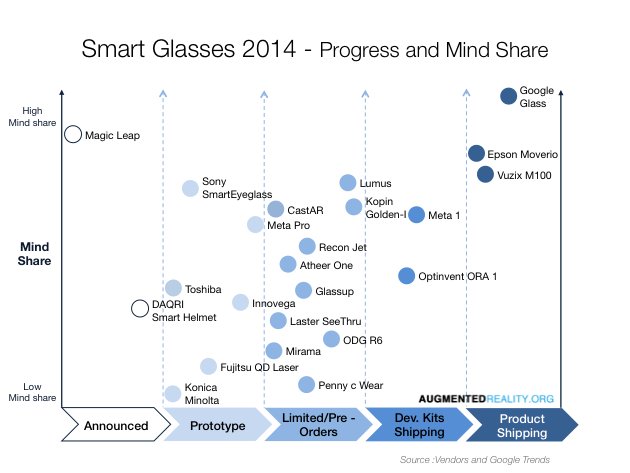 With over 10 new Smart Glasses launched in 2014 – this is a banner year for Smart Glasses. AugmentedReality.Org expects shipments to reach 1 million by fall 2015 – mostly for enterprises, followed by an increase to 10 million by 2016, 50-100 million shipments by 2018, and eventually capture the mainstream consumer space and cross 1 billion shipments at the turn of the decade. The report predicts that as the market matures and early winners emerge, by the end of 2016 the market will experience a “shakeup” with mergers, acquisitions, and significant investments. It argues that consumer electronics giants, and other players in the ecosystem have no more than a 12 months window to position their companies in the space (build, buy, partner) – or risk missing the opportunity. Driven by need of Fortune 500 companies to become more competitive, the largest investments in Smart Glasses and related software in the next few years will come mostly from the enterprise space. AR Glasses targeting niches (Bicycle helmets, competitive sports, entertainment) could also thrive. Once enterprise usage irons out the kinks of Smart Glasses and pushes their prices further down – the consumer market will take the lead – with the goal to ship a pair of Smart Glasses to every consumer. How will the market evolve? Who are the key players? What are their strategies? What are the needs, challenges, and solutions? What’s the value chain for AR Glasses? What’s the forecast for market adoption in the next decade? What are the drivers for adoption? What’s the right price? The right timing? Will this market happen at all? How big can it get? Google, Epson, Vuzix, Optinvent, Lumus, Meta, Sony, Samsung, Apple, Amazon, Kopin, ODG, Atheer, Glassup, Mirama, Penny, Laster, Recon, Innovega, Elbit, Brother, Oakley, Fujitsu, Microsoft, Canon, Lenovo, Baidu, Nokia, LG, Olympus, Foxcon, Konica Minolta, Daqri, Skully Helmets, Fusar, Magic Leap, Oculus. AugmentedReality.Org is a global not-for-profit organization with a mission to advance Augmented Reality to advance humanity. It catalyzes the transformation of the AR industry by educating the market about the real power of AR, connecting the best talent around the world, and hatching AR Startups and helping bring them to market. This report is a service to the community funded by members and sponsors. About the Author: Ori Inbar is the Co-Founder and CEO of Augmented Reality.ORG, and the founder and producer of Augmented World Expo – the world’s largest conference for AR. He dedicates his time is to explore and analyze every aspect of the industry, try every product, and speak with every expert. He lives and breathes Augmented Reality. In 2009, Ori was the co-founder and CEO of Ogmento, one of the first venture-backed companies focused on augmented reality games. Ori is recognized as a passionate speaker in the AR industry, a lecturer at NYU, as well as a sought after adviser and board member for augmented reality startups. The 27 pages report is available for $799 on AugmentedReality.Org’s website. AugmentedReality.Org members may purchase the report at a discount for just $99.